So what does that mean?!!! Well, I’ve had 4 interviews in limbo and it’s been driving me crazy! I want to share these with you so badly. I’ve been a hooper officially since April 2009 and I feel I’m immersed in the hooping culture enough to be wonderfully geeky about the hoops, the performers, the instructors, the clothes, the retreats, all of it! And I want to share it as experienced by other hoopers. This episode is the “tease” episode. I started an interview with Valentina of Unity Hoops and Twisted Orbit in February in San Francisco…so long ago!! She was THEE reason I started taking Burlesque classes which in itself is the art of teasing. 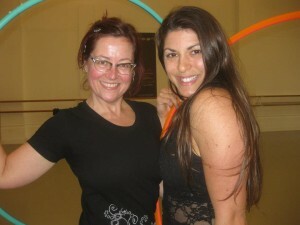 I wish I could take all of her classes in San Diego and be in her hoop troupe, The Hoop Unit! So, during our interview – which was AMAZING! – I did not hit the record button twice and didn’t get any of the main interview. So sad. But I did get a little taster, a tease if you will, before and after. In addition, I sat down to interview two of my friends in Washington State, successfully recorded one interview in which we discussed, in length, how to hoop on rollerblades – I’m still hoping for either a video or a picture as proof! – and hooping blindfolded with Baxter. 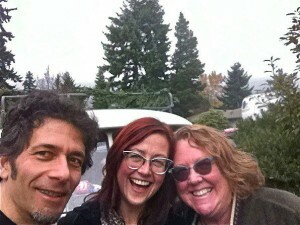 As we were about to start the second interview with my friend Annie, my batteries died. What we were about to talk about is her 50th birthday party celebration. I got to hoop with fire for the very first time. My hoop mama, Merilieu, felt I was ready, loaned me her hoop so I could practice and I performed for Annie using the same music that my hoop mama did for her fire hoop debut. And it was a total surprise for Annie. Yay! I’ll be interviewing Annie again to talk about that night and her life after finding the hoop. Yet another tease!!!! Stay tuned for a follow up interview with Valentina. Her life has really taken off. She’s teamed up with UK Hooper Steve Bags and together they’ve created Twisted Orbit. 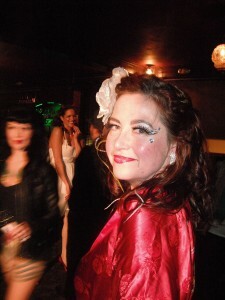 Also her troupe, the Hoop Unit, went to the Burlesque Hall of Fame in Vegas this year! Tease, tease, tease! The glove is off, people! You know you want more! Well, I’m gonna give it to ya! 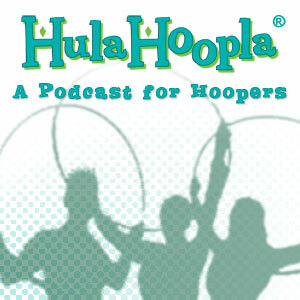 After I put out this episode and Episode 9 with Beth Lavinder and Antonio Gomez for Episode 10 – because the Bay Area Hoopers (BAH) celebrated their 10th anniversary this year! – I want to make this podcast legit. I’ll be looking for advertisers, sponsors, interviewees, web designers and musicians to make this a hooper’s resource of hoop geekery and love! 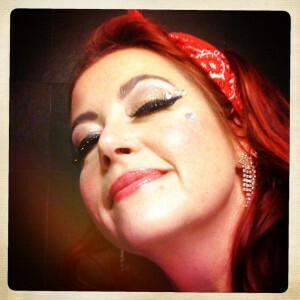 Till then, thanks for listening and happy hooping!